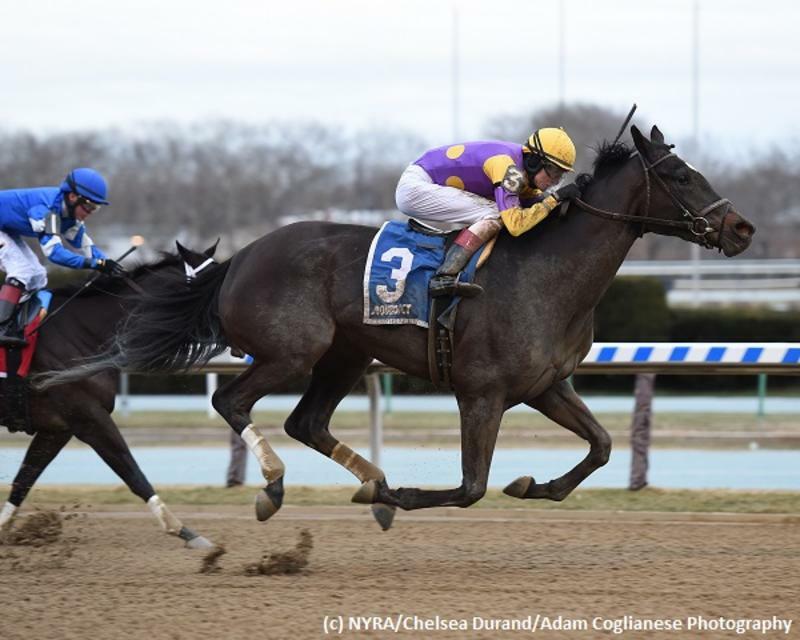 Dr. William B. Taylor and Dr. Joan M. Taylor’s homebred Midnight Disguise towered over her rivals in Saturday’s $200,000 Busher Stakes at Aqueduct, not only in talent but in size as well. The massive three-year-old filly bided her time in the rear of the field early as War Heroine set the pace up front. Jockey Trevor McCarthy allowed Midnight Disguise to settle into her immense stride on the backstretch while widest of all before sending her rounding the turn. The colossal lass rallied down the center of the track, seeming to take one stride for every two of her rivals’ steps. She easily gained control and pulled off to be 1 3/4 lengths clear on the wire while finishing a mile in 1:39.15 over the fast main track. Midnight Disguise cut back in distance for the Busher after taking the 1 1/8-mile Busanda Stakes by 4 1/4 lengths on January 25. Both races are part of the Road to the Kentucky Oaks series, though the Busher took place in the Prep Season portion and the Busanda is part of the Championship segment. The Midnight Lute miss now boasts a total of 60 points thanks to the winner’s share of 50 in this spot. Sara Street grabbed command entering the lane but was no match for Midnight Disguise. The dark bay lass was awarded the runner-up’s share of 20 points toward a starting berth in the May 4 Kentucky Oaks (G1) at Churchill Downs. It was another 1 1/4 lengths back to My Miss Lilly in third, who stuck her neck in front of Shamrock Rose to take home 10 points for a total of 12 points after a third-place run in the Forward Gal Stakes (G3) at Gulfstream Park on February 3. Shamrock Rose garnered five points to debut on the Kentucky Oaks Leaderboard. Midnight Disguise improved her career record to read 5-4-1-0 and nearly doubled her lifetime earnings to $257,600 in this spot. The Linda Rice-trained filly captured her debut on December 15 against maiden claiming foes by 6 1/2 lengths, then wheeled back off a six-day rest to take a starter allowance on December 21, both at Aqueduct. The New York-bred miss suffered her only loss to date when second in the East View Stakes while making her sophomore bow on January 14, and once again returned off a short break when lining up 11 days later to take the January 25 Busanda Stakes by 4 1/4 lengths last out. Midnight Disguise is out of the Yes It’s True mare Thin Disguise, making her a half-sister to once-beaten dual stakes victress Holiday Disguise, who captured the Biogio’s Rose Stakes at Aqueduct on February 8 off an eight-month vacation. Thin Disguise is herself a half-sister to Grade 3-winning millionaire Naughty New Yorker as well as Grade 2-placed stakes vixen Pupil. As part of the Kentucky Oaks Championship Series, the Busher virtually guarantees Midnight Disguise a berth in the Oaks at Churchill Downs, awarding 50 qualifying points to the winner, should her connections choose to make a bid for the lilies on May 4. The Busher victory brings her total qualifying points to 60, including 10 for her win in the Busanda. For her part though, Rice is focused instead on the next test, running back around two turns in the 1 1/8-mile Grade 2 Gazelle on the Wood Memorial undercard on April 7.